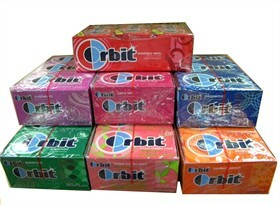 Order Your Chewing Gum in Bulk so You Never Run Out! It’s always a good idea to make sure you have plenty of gum on hand, whether it’s for yourself or to share with someone else! 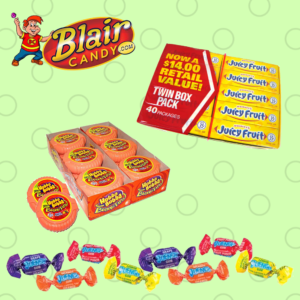 Ensure you never run out or make sure your baseball team’s concession stand is always stocked by buying it in bulk from Blair Candy. Regular Chewing Gum: Order Big Red, Juicy Fruit, Freedent, and other everyday chewing gums in bulk packs to make sure you’ve always got some when you want it! Stash a pack in your gym bag, work desk, and any other place you frequent so that you’re never in need. 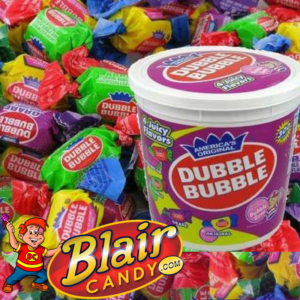 Bubble Gum: Our bulk packages of bubble gum are a great investment for your baseball team’s concession stand! 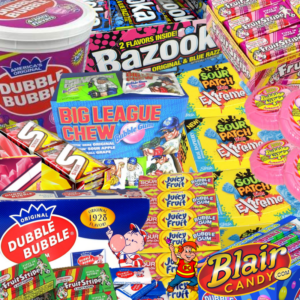 Players and spectators alike enjoy having some Bazooka, Dubble Bubble, or Hubba Bubba to chew on while enjoying America’s favorite pastime. Rely on our wide selection of chewing gum in bulk to keep your personal stash well stocked and your concession stand supplied! 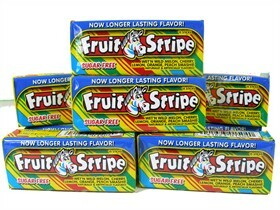 Fruit Stripe Gum is not only a classic, but it is just pretty awesome all around. The fun package features Yipes the Zebra, who is usually up to something crazy. Not only are their 5 delicious flavors per pack, each pack has temporary tattoos in them! If you love sweet and sour flavors, then you should grab a pack or two of this Sour Patch Gum. Just like your favorite Sour Patch Kids, this gum starts out with a shock of sour flavor, then ends with a sweet blue raspberry flavor. If you like fruity flavors, then Trident Layers is for you! Their Strawberry Citrus gum has layers of flavor, so your gum is constantly something new. With 14 pieces per pack, you’ll have enough to satisfy those cravings for a fruity piece of gum. 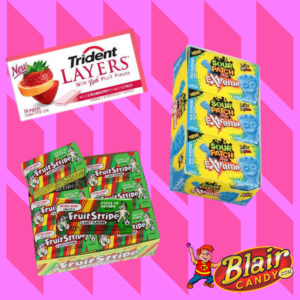 We have chewing gum in bulk with a great mix of flavors for all preferences. Try some of the new flavors, or keep with a classic. Shop now at BlairCandy.com for more! Chew on This: Sugar Free Gum Can Help Keep Cavities Away! I love sugar free gum. My desk drawer, coat pockets and purse are always well-stocked with at least a few pieces. I chew it when I’m stressed, I chew it when I’m happy, I chew it even when it’s not considered polite to chew it (Sorry, Mom!) But for as many pieces as I pop into my mouth without much thought throughout the day, there is one time it is a very conscious decision – after eating. I don’t always have the time or tools to brush, but I’ve always got a piece of gum! And as it turns out, chewing gum may actually be helping me keep my teeth in tip-top shape. I’d heard this before, but feared it was just an old wives’ tale! I recently came across an answer from Dr. Anthony Komaroff on CantonRep.com. The question? “I always thought chewing gum was bad for my teeth. But then a friend told me it actually helps prevent cavities. Who’s right?” Well, given the title of the article – Ask Dr. K: Sugarless gum can help prevent cavities – I’d say her friend is right! The doctor goes on to explain that sweets-loving bacteria live in our dental plaque, and “get the energy they need to live by consuming sugars in the foods you eat.” But these bacteria aren’t just your run-of-the-mill freeloaders living off your hard-earned lunch! No, they aren’t content to just eat your sugars and call it a day, they have to take it one step further and produce acids when they eat your sugar. And the acids? Those can lead to the big bad of the dental world – Cavities! But your body doesn’t want these acids to win; it has a vested interest in protecting itself. So it brings saliva to the rescue – saliva that “washes away the acids.” And when you chew gum, you get your saliva production kicked up a gear, giving your body more ammo against the acid.